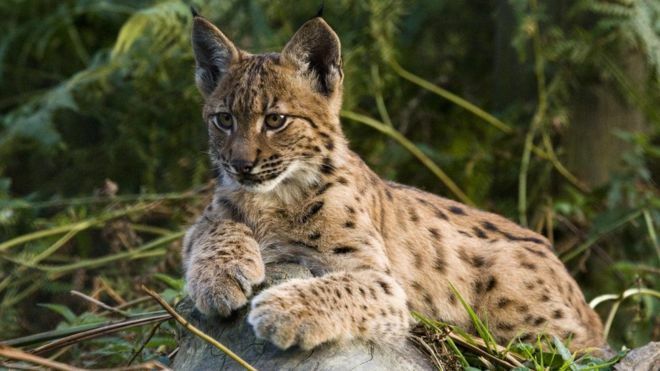 Farmers and landowners have been asked for their views on a proposal to bring back lynx to parts of Scotland and England. The Lynx UK Trust has suggested trial reintroductions in Aberdeenshire, Argyll, Northumberland, Cumbria and Norfolk. It said the plan has public support and research it commissioned sets out benefits of the big cats’ return. The National Farmers Union (NFU) has previously raised concerns. Scottish Natural Heritage, which is funded by the Scottish government, has also said reintroductions were “complex” and needed “considerable planning” to meet UK and international guidelines. Lynx became extinct in the UK 1,300 years ago. The Lynx UK Trust said 91% of 9,000 respondents to a survey it carried out were in favour of lynx being brought back to help control deer numbers. AECOM, consultants the trust commissioned to examine the benefits of lynx, have suggested that the cats could benefit eco-tourism as well as prevent deer from damaging crops. The trust said it now wants to hear views from landowners and farmers. Other organisations, including the Scottish Wildlife Trust, Trees for Life and Rewilding Britain, have separately said lynx could form an important part in “rewilding” areas of the UK. The Cairngorms National Park Authority has in the past weighed up the pros and cons of bringing back the big cats, and also wolves and bears. Of the three predators, lynx were deemed to have the least negative impact on farmers’ businesses. NFU countryside adviser Claire Robinson said reintroductions raised “big concerns” for farmers in England. She said: “Any species introduction, particularly if it has not been in this country for hundreds of years, can have a massive impact on the many benefits that the countryside delivers. “The environment has changed drastically and we do not know how lynx would behave in the current environment. It will be interesting to see how this plays out. While I don’t want to dismiss farmers’ concerns, oftentimes predators like big cats only take a small number of domestic animals. But sometimes the losses aren’t evenly distributed: some farmers don’t lose any animals whereas others lose a considerable amount. I also don’t know how healthy UK ecosystems are. If there is ample natural prey, then after the lynxes adjust to their new home depredation on livestock is likely to become a minor concern. Of course this is all speculation, and farmers’ concerns should be taken seriously. I am confident that if conservationists and farmers work together, they can find ways to make room for the lynx. It certainly will be interesting. I totally agree that it’s not as simple as introducing large predators and farmers start losing their stock. There is a lot of scaremongering out there. However, for any major reintroductions to take place – lynx, wolves, Scottish wildcat – farmers and landowners absolutely have to be on board or it just won’t work. While we might not always agree, understanding their concerns is vital for any reintroduction scheme to take place. Yes, very true. If lynx are reintroduced without taking farmers’ and landowners’ concerns into account it will likely not end well. If those individuals don’t feel listened to they may be highly resistant to reintroduction efforts, to say the least. Besides, we can’t force farmers to shoulder the burdens of living with large predators without trying to make it easier for them.